I really don't need to know why the power went out on a Saturday night that was clear as a bell with temperatures dropping into the negative number. I don't really want to pay for a "smart grid" that does nothing for me other than tell you there is a power outage in my neighborhood. I can do that by calling your hot line. As much as you try to sell this, it's not working. Because "smart grid" doesn't keep the power on. It's solely designed for you to spot power outages. What I need, what we all need, is an upgrade to our electrical infrastructure so the power doesn't go out on Saturday, December 7th at 8:30 p.m. Since covering all the windows, I've discovered that 69 is the new 72 and the three of us are happy and warm, but that warmth evaporates when it's not replaced. It was 66 when the power came on an hour later. I probably need to look at my attic insulation and add more. Still, on a night with no wind and a half moon emulating the lines from "A Visit From St. Nick", there shouldn't have been a power outage at all. Spare me the reasons. Spare me the rhetoric about a new technology that will find outages faster. Fix the delivery system so it doesn't break in the first place. 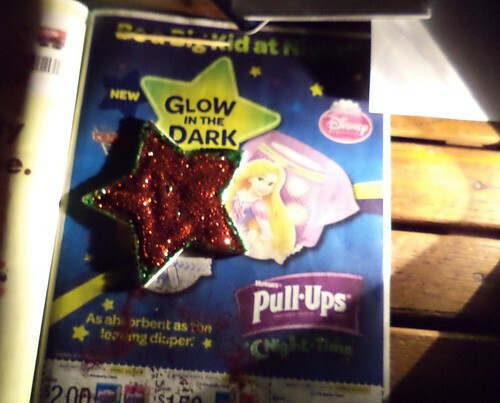 On the bright side, making glitter covered stars by flash and candle light is rather fun.